SONOSIM SUMMARY: This study utilizes dynamic two-dimensional ultrasound to characterize the structures of the laryngeal tract and to establish elements that characterize it during breathing. Ultrasound was used to characterize and measure the laryngeal tracts of fifty-five cadavers. The study recognizes that true vocal fold lateral motion is controlled by the arytenoids, and asserts that due to the hyperechoic nature of the true vocal folds, the arytenoids are the most accurate markers of true vocal fold motion. 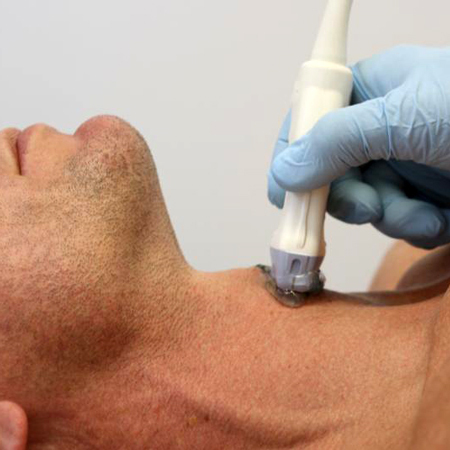 The study establishes sonographic measurements that may be useful to physicians who wish to perform ultrasound of the larynx and surrounding structures. Bergeret-Cassagne H, Lazard DS, Lefort M, et al. Sonographic dynamic description of the laryngeal tract. J Ultrasound Med. 2017 May;36(5):1037-1044. Vocal fold motion was analyzed during free breathing using two-dimensional dynamic ultrasound imaging. Two cadavers were first analyzed to define easily identifiable landmarks. Motion of the laryngeal tract was then analyzed in an axial plane. Left and right arytenoids and thyroid cartilage were defined on images corresponding to abduction and adduction of the laryngeal tract. Associated area measurements were established for 50 healthy subjects. All area indices were significantly larger during abduction than adduction. Symmetry of motion was established by comparing each hemi-larynx, and mobility fractions were defined. Normal values of laryngeal motion during free breathing were thus established. To read the article, visit the Wiley Online Library website.